Watch an 18-year-old Scott Pendlebury speak to CTV for the first time after making his debut against Brisbane in round 10, 2006. Watch new captain Scott Pendlebury speak to CTV's Clinton Bown for the first time after his AFL debut against Brisbane in round 10, 2006. Scott Pendlebury trains with the Victorian State of Origin team at the MCG in 2008. 1. He ranks second only to Dane Swan as Collingwood’s most followed player on Twitter. As of 31 January 2014, Pendlebury (65,558) is 30,494 followers behind his tattooed teammate who has 96,052. 2. Pendlebury spent time at the Australian Institute of Sport on a basketball scholarship in 2005, but later quit to play football and was drafted only months later. His place in the AIS program was taken by Patrick Mills, who is now playing in the NBA. 3. 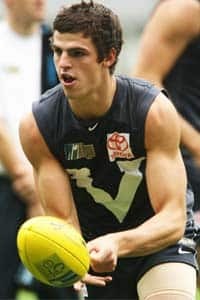 Despite being supremely talented, Pendlebury did not rank in the top 10 for any category of testing at the 2005 Draft Camp (bar his hand span). 4. He was one of six Gippsland Power players to be drafted by Collingwood between 2005 and 2008. The other boys from the eastern Victoria region were Dale Thomas, Tyson Goldsack, Brent Macaffer, Jarryd Blair and Tristan Francis. 5. Pendlebury is the only player on Collingwood’s list to have represented both his state and country at the highest level. He was selected for Victoria in the AFL Hall of Fame Tribute Game in 2008 and later that year represented Australia against Ireland in the International Rules Series. 6. He hasn’t been wearing the No. 10 in each of his 171 games for Collingwood. He wore No. 16 in his first nine games in 2007. 7. He is engaged to long-term girlfriend Alex Davis last October. 8. His two brothers are both talented footballers in their own right. Older brother Kris played 69 games for Collingwood’s VFL team between 2008 and 2012, captaining the club from 2010-2012 and winning the Joseph Wren Memorial Trophy as the team’s best-and-fairest player in his final season. Ryan, his younger sibling, has played for the Gippsland Power and the Casey Scorpions in recent years. 10. Pendlebury debuted on a very eventful night for Collingwood’s four most recent captains. It was 3 June 2006, with the Magpies taking on the Brisbane Lions on a Saturday night at the MCG. Nathan Buckley, then in his second last year as captain, had 29 possessions and kicked a career-high six goals. Scott Burns (captain 2008) also had 29 touches and made seven clearances. Nick Maxwell (captain 2009-2013) broke his leg in a heavy collision with Brisbane strongman Jonathon Brown but still managed to bounce back to his feet and jog away. And Pendlebury? He had 11 possessions from 66 per cent game time and managed to kick a goal with his first kick. It was round 10, 2006. Scott Pendlebury, aged 18, receives his first Collingwood jumper (No. 16) from club legend Billy Picken and coach Mick Malthouse at the 2006 Season Launch at Crown Palladium.